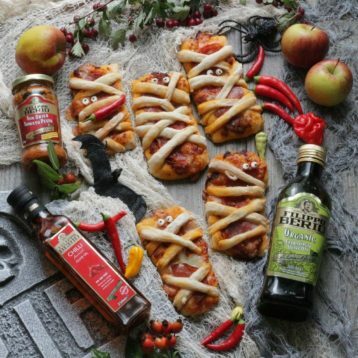 Get into the Halloween spirit with this spooky Mini Mummy Pizza recipe! This recipe can be made by making an olive oil dough from scratch or with ciabatta rolls if you’re short on time! It’s also completely versatile if you want to switch up the toppings!⁣ Fun to make with the kids and the perfect addition to any Halloween party table! To make vegetarian, swap out the salami for mushrooms or thinly sliced peppers. This recipe was shared by 'Ink Sugar Spice' blog. Mix all the ingredients for the pizza bases (flour, oil, salt, sugar, and yeast) and 350ml lukewarm water together in a large bowl, using your fingers. Tip out on to a clean surface and knead for ten minutes, you may need to add a little flour to the work surface if it continues to stick. Alternatively you can use a stand mixer or food processor rather than kneading. When the dough becomes smooth and slightly glossy on the surface, it's been kneaded enough and is ready for proving. Rub a little olive oil round the bowl and place the kneaded dough in. Cover with the linen tea towel or cling film and leave to rise in a warm place for around an hour (until it has risen well and a few large bubbles have appeared under the surface). Lightly dust your work surface and tip out the dough. Punch down the dough to knock the air out of it. Using the rolling pin and/or your hands, flatten out the dough as thinly and evenly as possible into a large rectangle. Cut off a third off the end of the rectangle - you will need this for the mummy 'wrappings'. Cut into long strips of about 1cm width and set aside for now. Gently transfer the large portion of the flattened dough onto a piece of baking paper (this makes each mini pizza easier to pick up and move). Cut the dough into twelve equal pieces, by first cutting along the middle lengthways, then making five equally spaced cuts. You should have twelve mini rectangles, about 20cm x 5cm (plus the 'spare' piece of dough you cut off). Using scissors, cut the baking paper around the twelve pizzas, so they each have their own portion that they are sitting on. Preheat oven to 210ºC fan/ 230ºC conventional. Mix the pesto, puree and chilli oil in a small bowl to make a pizza sauce. Spoon it out equally between the twelve mini pizzas, using the back of the spoon to spread it out. Cut two thin slices off the mozzarella and keep to one side for the mummies' eyes. Rip up the rest of the mozzarella evenly between the twelve pizzas. Now lay the pepperoni, salami or other chosen toppings on top of the mozzarella. Taking one of the dough strips, you can now start to make the mummy 'wrappings'. Lay a dough strip diagonally across the pizza and cut to size. Repeat in a random crisscrossing pattern until you've 'wrapped' each mummy pizza. Squash the ends of every strips just slightly into the pizza base, otherwise when they bake they will lift up. Place six pizzas spread out on each of the two baking trays, so they have some space to rise and spread out. Bake for 14 - 16 minutes until the bottom of the pizza is baked, the top of the wrappings are a nice golden brown and the mozzarella is gooey and a bit crispy round the edges. While the pizzas are cooling a little, you can make the eyes. Using a wide straw punch out circles from the remaining mozzarella slices and arrange in pairs (or even some threes!) on the pizzas, so it looks like the mummies are peering out from their wrappings. Add a Nigella or black onion seed (or a little piece of black peppercorn) to each eye so it looks like a pupil. Best served still warm, but can be eaten cold. *If making ciabatta pizzas, buy 6 ciabatta rolls instead of the pizza base ingredients. 1. Preheat oven to 210ºC fan/ 230ºC conventional. 2. Instead of cutting the ciabattas in half, carefully slice each ciabatta roll into three even slices along their lengths. This should leave you with a top, middle and bottom piece for each ciabatta roll. 3. Put all of the top slices to one side as you will need them later. 4. Space the other 12 slices (6 bottom slices and 6 middle slices) onto two baking trays. 5. Follow steps 12-14 of the original recipe. 6. Cut the top ciabatta slices that you kept to one side into 1cm strips. 7. Lay a strip diagonally across each of the ciabatta slices on the baking tray and cut to size. Repeat in a random crisscrossing pattern until you've 'wrapped' each mummy cibatta pizza. 8. Bake for around 10-12 minutes, until the mozzarella is gooey and a bit crispy around the edges. 9. Follow steps 18-20 of the original recipe.